You walk into a room and they're sitting there watching television. At the same time each one is doing something on their own laptop with headphones in their ears. They emerge from what absorbs them to smile and hug you and then they sink back into their respective absorption. It's the way things are. They remind me of myself when I was their age, in my early twenties. Music was my first love which totally absorbed me. Listening to it on the blue transistor radio. All we had was Radio Eireann and an hour of Larry Gogan and at night we could get 208 Radio Luxembourg. Enough to feed my need for anything modern - pop, rock, folk. I got to know ever detail of the charts, becoming a bit of an encyclopedia, almost good enough to rival Larry Gogan who knew everything. By my early twenties I had acquired a radio cassette recorder and as I write this I realize that my nephews and nieces have no idea what such a machine is. But it was my machine and my passion. It was perpetually set to record with the pause button on so that whenever a song came on that I liked I hopped up to record it, ending up with quite an impressive collection of cassette tapes that were probably illegal. 1977 was one of the best years of my life. I was free and in love and halfway on my way to being a hippie. 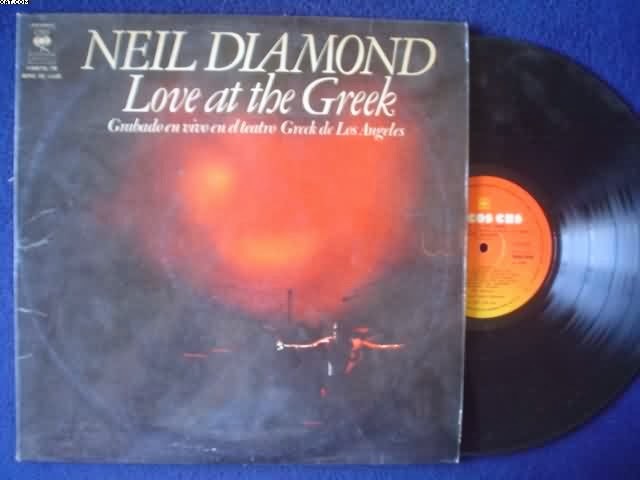 Neil Diamond had just released the live album 'Love At The Greek' which I went out and bought. Back home I had the house to myself so I got out the record player, put the two box speakers facing each other on the floor, put on the record, turned it up loud and opened the sitting room windows so that the neighbours could share the experience. Then I lay down on the floor with my head between the speakers and went to heaven with 'Glory Road', 'I've Been This Way Before', 'Jonathan Livingston Seagull'. Not quite as impressive as his earlier 'Hot August Night' but good enough for me on that day. Mam was coming down Parnell Avenue on her way home from work in SPS and she heard the music at quite a distance, horrified beyond words when she realized that the noise was coming out of her own house, so she tore into me in no uncertain terms and put a stop to my glory. I was mortally offended of course. But I was learning something important that would serve me in more critical situations later in life. I realized that I had become a slave to this beautiful gift of God; in some way the gift had become my god. Not only that but my slavery, addiction to music was affecting other people, impinging on their lives. This is true of the more serious addictions that I've had to battle with. We cannot be slaves or addicts in isolation. And I began to pray that God would help me to love Him more than the music because something in me knew that this is the order in which things should go - God first, everything else next. Seek first the kingdom of God and all these other things will be added. In all my subsequent, more serious slavery's I constantly make this prayer, to love, to desire God more than whatever it is. With music it probably took another 13 years before I achieved the right balance. And I didn't lose the music in the process. I have always loved and yearned for God but always too there is the struggle to maintain the right balance, not letting anything take over the place that belongs properly to God. This is what stirs in me as I read these lines from Luke's Gospel 16 - you cannot be the slave of God and money or anything else, like music. And if you are a slave to anything or obsessed by anything - to the good things of life or to the destructive things - then part of the road to healing involves asking for the grace to love God more. It does not of course mean becoming obsessed by religion because that too can be slavery. It is about loving God - and loving the others in my life - giving preference to a loving that is free and liberating.